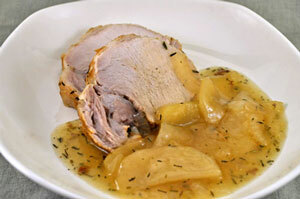 Roast Pork with Apples and Onions, Thyme for Cooking easy gourmet dinners. Chicken livers are not everyone's favorite. I understand - I'm not fond of gizzards. If you are not a liver fan, substitute some sautéed mushrooms, canned asparagus or artichoke hearts, hard-cooked egg, whatever appeals to you. We use a bit of apple juice during the winter so, I buy a 6-pack of small juice boxes to have on hand. Each one is about 8oz. Leftover pork is used in the Hash. This salad is traditional and served in every cafe in France - except with escarole and gizzards rather than spinach and livers. I added the bacon - just because. Cut livers in half, trimming any fat. Heat butter, soy sauce and vinegar in nonstick skillet over medium high heat. 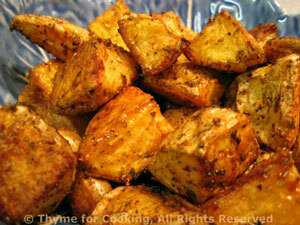 Add bacon and fry until almost crisp (it's staying in the skillet). Add livers; brown well, 2 - 3 minutes per side, but do not over cook. Slightly pink in the center is good. 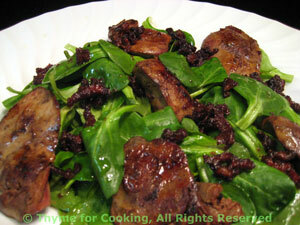 While livers brown, prepare spinach and put into a bowl. Toss spinach with half of the vinaigrette. Arrange on 2 plates. When livers are done arrange on spinach. 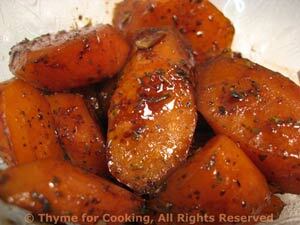 Pour remaining vinaigrette into skillet and deglaze pan - stirring up the bacon and the browned bits. Pour warmed dressing over livers and serve.